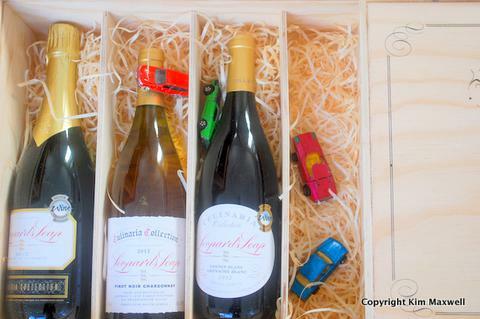 Flavourcape » flavourblog » WINE: The Culinaria wine range. Made for food? WINE: The Culinaria wine range. Made for food? The Leopard’s Leap Culinaria Shiraz Grenache 2010 (R89). Recommended foods for the Leopard’s Leap Culinaria Shiraz Grenache 2010 include spicier foods such as spiced Moroccan lamb, Indian shami kebab and Chinese Szechuan beef. However roast venison, beef and lamb served with a reduction sauce or with chocolate-chilli sauces are also on the list. Other foods: rich casseroles such as oxtail and beef bourguignonne, or dishes that incorporate beef, lamb, pork or duck, with various beans and lentils. Food no-no: most fish dishes, and overly ‘fiery hot’ dishes, the reasoning being that the perception of alcohol will increase and the wine will be stripped of its fruit. My dish: rustic spiced-tomato lamb shanks. I watched plump pieces of lamb shank being cut from a whole sheep and trimmed at a Beaufort West butchery on a recent overland trip. The low Karoo price per kilo made lamb shanks into an affordable splurge for this dish. Mine are slow-baked with cinnamon sticks, then tinned tomato, chilli and brown lentils are added near the end of cooking. 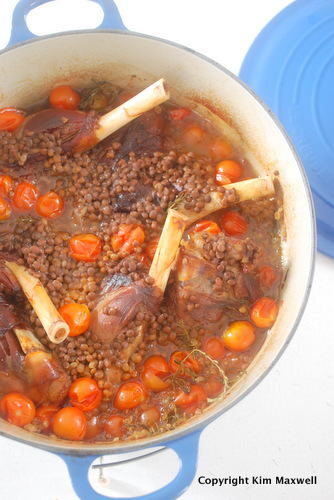 Learn to make the Rustic spiced-tomato lamb shank recipe here The Plaisir de Merle Cabernet Sauvignon 2009 brought by a lunch guest possibly pipped the Shiraz Grenache with the lentil shank dish, showing this wine up as simpler and fruitier. But then the Plaisir de Merle is made in a more serious style, and costs double at around R160. Score for the Culinaria Shiraz Grenache 2010 with my rustic spiced-tomato lamb shank: 8 out of 10. On to the Leopard’s Leap Culinaria Grand Vin 2010 (R89). Leopard’s Leap recommends Chateaubriand or grilled, plain aged steak with this Bordeaux blend (it’s almost half Merlot, with fairly similar amounts of Cabernet Sauvignon Cabernet Franc, and a dash of Petit Verdot). Other foods: slow-cooked meats and stews, roast chicken, turkey, duck and quail, or liver in all its forms. Food no-no: venison, strongly-flavoured cheese such as a blue, or spicy-hot foods as these could ‘make the wine taste astringent and accentuate its alcohol and tannin’. My dish: Because they also recommend ‘herbal and earthy ingredients such as garlicky, herb-strewn meat roasts’ and ‘lamb with rosemary or thyme’ I mixed up some of those elements. This red blend showed nicely understated oak (new and second-fill barrels). And it worked very well with aged rib-eye, braaied simply in olive oil, studded with chopped garlic cloves and dusted in fresh rosemary. Score for the Grand Vin with my rosemary-and-garlic rib-eye: 8 out of 10. The next meal included Leopard’s Leap Culinaria Pinot Noir Chardonnay (R69). With a 60% Pinot Noir in this blend, the recommendation is for dishes with rich textures and flavours – butter, cream, melted cheeses – as well as ingredients such as white beans or polenta to add texture. Other foods: Smoked, grilled or lightly charred dishes. A variety of fish types, especially tuna and swordfish, or mild and sweet crayfish or prawns. Also given the thumbs up were white and brown mushrooms, especially if butter is used in the preparation. Food no-no: any sweet foods, or recipes that are too bold or showing extreme levels of spicy heat. My dish: I threw together a fishy pasta we often make for friends: leeks and mushrooms panfried in butter with a hint of dried red chilli, cooked down with a splash of Pinot-Chardonnay, and then finished with half a carton of cream. Towards the end we add bite-size pieces of lightly smoked Franschhoek trout and baby spinach, and mixed it through linguine. Score for the Pinot Chardonnay with the creamy trout linguine: 9 out of 10. The last wine was my favourite. Sipped alone, Leopard’s Leap Culinaria Chenin Blanc Grenache Blanc 2012 (R65) has a lovely sensation of silky texture from the Grenache Blanc. With old vines originating in the Voor Perdeberg and older oak, it makes for a very appealing white blend. The Culinaria Chenin Blanc Grenache Blanc is designed to partner cold shellfish, plain grilled white fish, and cold tomato-based salads. Other foods: white meats ‘with ample fresh herbs’ but excluding rosemary and thyme, dishes including citrus juice, dill and sour cream, or stuffed baby marrow and green beans. The ingredient list also includes stirfried calamari with lots of lemon, and seafood salads with freshly prepared mayonnaise. Food no-no: Savoury Chinese or Latin American dishes that tend to be sweet, or dishes based on caramelised onions, sweet butternut or root vegetables. Rich sauces might be overpowering here. My dish: I didn’t have any exotic ingredients lying around, so we baked readymade chicken schnitzels, squeezed over a lot of lemon, and jazzed it up with homemade mayonnaise freshened by chopped Italian parsley. On the side, thin oven-baked potato wedges and panfried onions, courgettes and baby spinach. Score for the wine: 10 out of 10. Score for the Chenin Blanc Grenache Blanc with the chicken schnitzel, parsley mayo and greens: 9 out of 10. In short the Culinaria wine range for food is a great idea. Most of us don’t want to think too hard about what to serve at each meal. This range makes food experimentation fun, and is fairly reasonably priced. It’s also rewarding trying to match complementary instead of clashing ingredients. Our toddler thinks the wooden wine box makes a nifty garage for his toy cars too. LEOPARD’S LEAP WINERY, R45 Main Road, Franschhoek. Tel 921 876 8002. Contact Liné for wine info or food-pairing suggestions at 021 876 8843. All Culinaria wines are exclusively available from the estate (A Méthode Cap Classique and a Muscat de Frontignan 2013 dessert wine are also in the range).